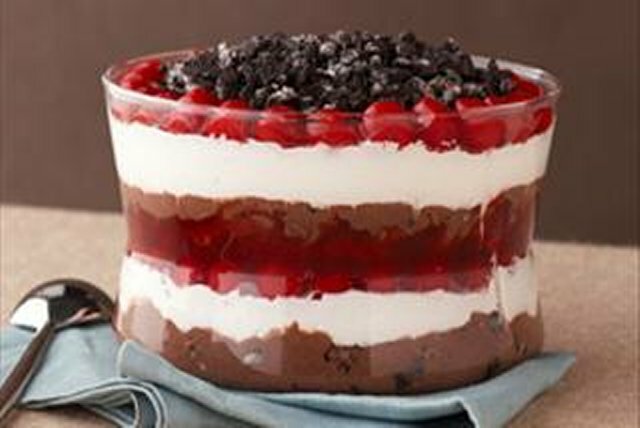 An impressive looking layered dessert, easy enough to prepare any night of the week. Reserve 1/2 cup cookie crumbs; stir remaining crumbs into pudding mixture. Spoon half into 1-1/2-L serving bowl; top with layers of 3/4 cup of the remaining Cool Whip and 1 cup pie filling. Cover with layers of remaining pudding mixture, Cool Whip, pie filling and reserved cookie crumbs. Garnish with toasted sliced almonds just before serving. Place cookies in resealable bag; use rolling pin or bottom of heavy pan to coarsely crush the cookies. Dessert can be made ahead of time. Refrigerate until ready to serve.